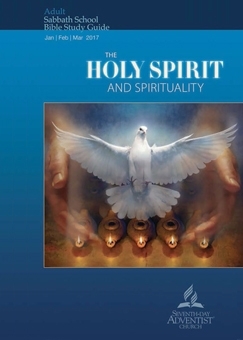 COMMENTARY ON "THE HOLY SPIRIT AND THE FRUIT OF THE SPIRIT"
The daily quarterly lessons for this week do a good job of covering the various manifestations of the fruit of the Holy Spirit outlined in this memory text yet ignores the implications of the last phrase...."against such things there is no law". Notice that this verse begins with the word 'but' which shows 'the fruit of the Spirit' is contrasted against the text leading up to the work of the Holy Spirit. Even more important, the context as to why the Apostle Paul even has a reason to mention 'the fruit of the Spirit' is missing. Therefore this commentary is in the form of an overall view of the book of Galatians. Important as is the 'fruit of the Holy Spirit' in the growth (sanctification) of Christians it is subordinate to what the Apostle Paul is concerned about. All else is dependent on understanding the pure biblical gospel of Jesus Christ. In Galatians 1:1-5 we have his opening greeting to the churches in the Roman province of Galatia. The Apostle Paul identifies himself as one who was personally appointed by Jesus Christ thereby establishing that he has the authority to confront issues that affect Christian doctrine, followed by a blessing of 'grace and peace' in the name of the God the Father and the Lord Jesus Christ who gave himself over to deliver us from our sins in this evil age. Much of chapters one and two are given over to reinforcing and making it clear he is speaking in the knowledge, approval and name of our Savior Jesus Christ which would also include support from the apostolic leadership in Jerusalem. There is and can only be one gospel message that establishes who is and who is not in the kingdom of God. If anyone, including someone who appears to be an angel from heaven introduces something other than what Paul and the other apostles are preaching, that false non-gospel is to be ignored. Paul then placed a curse on those who preach such a false message. The chronic uncertainty of those who are Adventist is that no matter how perfectly you keep the laws that identify who you are as an Adventist your works will never be credited to you as justification. Furthermore, if you could actually keep the law, you wouldn't need the Savior Jesus Christ. Who among you would want to propose such a heresy? The heresy Paul is confronting is the false belief centered on 'works of the law' instead of 'hearing with faith'. Paul then examines the faith of Abraham. The Apostle Paul knows he is addressing Christians, those whose lives have been changed by the shed blood of the Savior and are personally indwelt by the Holy Spirit. Instead of the works of the law the righteous shall live by faith. Paul reveals in Galatians 3:19-22 that the law 'imprisoned everything under sin, so that the promise by faith in Jesus Christ might be given to those who believe'. When we come to chapter four, it is clear that Paul is confronting those who are preaching the need to do 'the works of the law' instead of our being justified by faith. Therefore he explains in human terms what was the function of Old Covenant law. The gospel message which is centered solely on the death, burial and resurrection of Jesus Christ for the remission of our sin is the 'fullness of time' spoken of in the above analogy. Those who have the 'faith of Abraham' are no longer slaves to the law. Paul now comes to the specific question of circumcision (Gal. 5:2-12) which was the sign of the covenant given to Abraham (Gen. 17:9-14) and must be observed before you could enter into the provisions of the Old Covenant which Paul is calling a "yoke of slavery". While circumcision isn't normally considered an issue within Adventism the point that gets ignored is that the 'yoke of slavery' Christians have been set free from is the whole of the Old Covenant, not just the law of this covenant or some supposed part of that law because 'the law' is the whole of the law found recorded in the first five books of the Bible. Paul's point is that we are either under all the law or none of it. All sinners who are saved by the blood of Jesus Christ, are either walking by the Holy Spirit or are still walking according to the flesh. This is why it is so critical that you understand the one and only biblical gospel message of the death, burial and resurrection of Jesus Christ that frees you from your failed works of the flesh. Since the quarterly lesson covers the fruit of the Spirit very well the only point that needs to be stressed in this commentary is that Paul is speaking to those who are 'in Jesus Christ', those who have "have crucified the flesh". It is they who have evident in their lives the fruit of the Holy Spirit through their spiritual growth. Those who are spiritually mature are to restore, "in a spirit of gentleness" those who are caught in any transgression. Keep watch on yourself lest you also may be tempted. Fulfill "the law of Christ" by bearing each other's burdens. Note well that the Old Covenant law or any part of law is not this law. Therefore any transgression has nothing to do with Old Covenant law. See also Romans 8:1-8, or better yet, study the chapters that lead up to this passage in Romans. 'Brothers in Christ' have been created for good works, Ephesians 2:10 & 1 Corinthians 3:10-15. However each of us are to test our own works to see if they are centered on Jesus Christ and the work of his gift, the indwelling Holy Spirit. Those who teach the word of God were to be directly supported by those they teach. Remember the whole point of the book of Galatians was the purity of doctrine, especially what is the one and only gospel of Jesus Christ. Beyond that, each local body of Christ should support and in turn was supported by their own elders, Acts 14:21-23. The role of the 'Jerusalem Council' was to settle questions concerning Christian New Covenant doctrine, Acts 15. Do not mock God. Instead "do good to everyone" especially 'fellow brothers in Christ'. Paul's final warning and benediction is written in large print in his own hand which appears to be an allusion to the "thorn in the flesh" he mentions in 2 Cor. 12:7-10. Even those who have been circumcised do not keep the Old Covenant law. Since Christians are not under this law or any of its requirements they can expect to be "persecuted for the cross of Christ" by those who preach such heresy. For the same reason, this is why orthodox 'born again' Christians do not preach 'Sabbath keeping' as having anything to do with the salvation of their souls. Since Christians are a "new creation" neither physical circumcision nor uncircumcision counts for anything. It is enough for the Apostle Paul that he bears the marks of Jesus upon his body. Paul's closing benediction is "The grace of our Lord Jesus Christ be with your spirit, brothers. Amen". The Apostle Paul, having been personally chosen by our Savior Jesus Christ, establishes that he has the both the authority and responsibility to address questions of Christian doctrine. The theme for the quarterly lessons this week is 'The Fruit of the Spirit' as outlined in Galatians 5:22-23 yet ignores what this means. Spiritual fruit can only come from the Holy Spirit, meaning only those indwelt by the Holy Spirit can display these gifts. Paul makes it clear, in his address to 'the churches of Galatia', that he is speaking to primarily those who are born-again Christians and have been indwelt by the Holy Spirit. Therefore it is appropriate to turn to other Scripture texts to be clear on what Paul means when he stresses that there is only one gospel message of Jesus Christ. Paul's theme, Gal. 1:6-10, is that there can only be one gospel of Jesus Christ for the salvation of your soul. If anyone preaches anything else, even if they claim to be an angel from heaven, that person is to be ignored. Anyone who preaches such a message is accursed. The gospel is; Jesus died for our sins, was buried and was raised three days later, 1 Cor. 15:1-5. Christians are justified by faith in the finished work of Jesus Christ plus nothing else. Christians receive the gift of the Holy Spirit by faith in the finished work of Jesus Christ, not by works of the law. Since we have been set free from the works of the law do not accept circumcision or any other requirement of this law. That would include Sabbath keeping or food laws, founded upon what is now an obsolete covenant. To return to the Old Covenant law is to place yourself under a yoke of slavery. Know that the 'law of the Spirit' never becomes a contradiction of what is sin as you study and understand Romans 8:1-11. In a contextual study of Galatians, when you come to the chapter concerning the fruit of the Holy Spirit your understanding must be built upon what came before in the previous chapters. The fruit of the Spirit, the evident working of the Holy Spirit in a person's life, begins by accepting no gospel other than the finished work of Jesus Christ. Your sanctification and display the fruit of the Spirit can only be founded in faith upon the one and only gospel of Jesus Christ. Copyright 2017 BibleStudiesForAdventists.com. All rights reserved. Revised January 30, 2017. This website is published by Life Assurance Ministries, Camp Verde, Arizona, USA, the publisher of Proclamation! Magazine. Contact email: BibleStudiesForAdventists@gmail.com.